Is a Wedding Marquee Right For Your Big Day? Home / Tips / Is a Wedding Marquee Right For Your Big Day? The choice of wedding venues is vast and varied these days with many venues now getting in on the act. Add to this the possibility of hiring a wedding marquee and you really do have carte blanche on location and styling. This article will look at what is available with wedding marquees and discuss some of the benefits, hopefully answering some questions for the undecided brides to be. 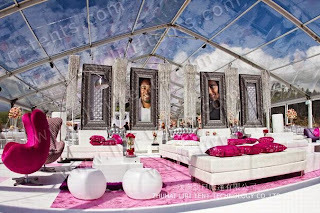 Modern wedding marquees are metal framed structures which don’t require any poles as per the more traditional marquee. Although the traditional marquees might provide a more nostalgic feeling, the metal framed clear-span marquees are much more contemporary and practical as there are no central poles taking up valuable space, not to mention getting in the way of furniture and guests. Event marquees are probably perceived as a summer solution only, which is not the case. Yes, they are easier to construct in decent weather and on to dry ground, but modern equipment and methods ensures marquees can provide a warm, safe and dry party venue any time of the year. Flooring systems, heating, doors and hard walling all help create the perfect winter wedding. There are many advantages to using wedding marquees as opposed to a hotel or similar venue. For many the idea of getting married at home is a dream and with a half decent sized garden it can easily become a reality. Don’t get too caught up on the size of your garden though as you will be surprised at what a decent wedding marquee company can recommend and then go on to achieve. If you have a desire to have your wedding at home, seek expert advice first on what can be achieved before you rule your garden out for being too petite! If you are going to have a wedding marquee at home you need to consider the construction and dismantle time as well as other facilities for your guests. Most reputable marquee companies will build and dismantle the marquee as quickly and professionally as possible with minimal disruption. Especially in the summer as they are keen to get the equipment on to the next job and happy couple! Equally, most good wedding marquee hire companies will advise on, recommend and even provide the additional services and equipment you will need such as temperature control, loos, furniture, decor and catering. If you have a venue in mind but your guest list is growing you might like the idea of having a wedding marquee to accommodate the overflow. Or, you might absolutely love the setting of a venue, but aren’t so keen on the set-up and facilities inside, so a marquee in the grounds would be perfect. Many venues allow this as a matter of course but might have a preferred supplier they use, so check that as well. The other point about venues is don’t rule any out until you have found out whether or not you can actually get married there. The days of a church wedding and hotel reception are long gone and venues include race courses, museums, zoos, golf clubs, pubs and restaurants to name but a few! Many of which will include marquee hire within their package. If you choose to have a wedding marquee and whether it sits nice and cosy in your back garden or takes up a tiny corner in the grounds of a grand stately home, you will certainly have more flexibility and choice in everything. This is obviously a personal thing as you may be someone who doesn’t like to be overwhelmed with choice, but, if you are and have lots of fantastic and favoured ideas, then the idea of wedding marquees, Winter or Summer may be just up your aisle! the most professional tent maker in China.